To build its Pure Water recycling plant, the city must move some of SDG&E’s equipment. The company is refusing to pay for the relocation, citing a 1908 legal case, handing the city a tab that could add $48 million to the cost of the project. In recent months, the city and San Diego Gas & Electric have tussled over the future of energy in San Diego. Now, they’re in a multimillion-dollar dispute over the largest local water project in modern history. The city is working on a $1.4 billion water recycling project, known as a Pure Water. A new water treatment plant will eventually purify enough sewage to provide a third of the city’s drinking water. To build the plant and connect it to the rest of the city’s water system, the city must move some of SDG&E’s equipment. The company is refusing to pay for the relocation, handing the city a tab that could add $48 million to the cost of the Pure Water. Plus, the company’s stance will apply to other water department projects, increasing construction costs by a total of $75 million over the next several years, according to the city. The dispute goes back to a pair of contracts SDG&E signed nearly 50 years ago. These so-called franchise agreements allow the company to use public rights-of-way to install poles, overhead power lines and underground gas and electric lines. For that privilege, the company pays the city about $64 million a year in fees; in exchange, the company gets a monopoly on energy infrastructure. But SDG&E is relying on a 1908 state Supreme Court case to argue that the city’s water department isn’t exactly “the city,” so the contract language doesn’t apply in this case. In June, SDG&E’s manager of major projects, Andy Renger, sent the city a letter making that and other arguments. He said the company would not pay to move any of its stuff to make way for the city’s water department. He made a legal argument, as well as an economic one. “The high cost of this project should not be spread among SDG&E’s entire territory, which includes other cities and counties,” Renger wrote. Whether he meant to, he was playing off already-simmering tensions between the city and its suburbs over not only the costs of the Pure Water project but also electricity. City officials were taken aback by SDG&E’s letter, which they portrayed as a last-minute wrench thrown at a project they’d been talking about for more than a decade. Mayor Kevin Faulconer was not amused. “The mayor strongly disagrees with SDG&E’s interpretation of the franchise agreement,” said Johnnie Perkins, the city deputy chief operating officer who oversees the water department. For months, the mayor’s administration has gradually drifted apart from SDG&E, one of the region’s largest employers. The biggest sign of that split came in October, when Faulconer said the city would start its own power-buying agency to compete with part of SDG&E’s business. This isn’t the first dispute over gas and power line relocations. In 2007, a three-judge appellate panel sided with the city after SDG&E refused to pay to relocate equipment to make way for Petco Park. That time around, the initial sum in dispute was smaller – just $650,000. And, as the city and SDG&E were arguing over who must pay, they agreed to split the costs until the matter was settled. This time around, the city is paying SDG&E all the money upfront but reserving its right to fight to get it back from the company. 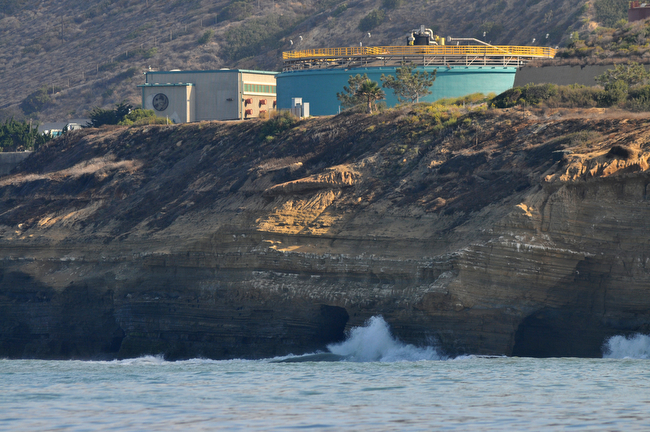 In some ways, SDG&E had the city over a barrel: The timeline for Pure Water is tight, because the project is needed in part to satisfy federal regulators’ demands that the city curb the amount of treated sewage it dumps into the ocean. By recycling that water before it’s dumped, the city can spare itself that regulatory wrath and also provide a new drought-resistant water source to the city. It remains to be seen who will have the last laugh, though, since the matter may end up in court. SDG&E is also trying to negotiate a new franchise agreement with the city. The current 50-year deal expires in three years. The city can either do another deal with SDG&E, or it can effectively destroy SDG&E’s monopoly by making a deal with someone else or taking over SDG&E’s equipment, which is something environmentalists are urging the city to consider. The Pure Water-related relocation cost will, at least temporarily, increase the cost of the total project by 3 percent. It’s unclear what that will mean to water ratepayers’ bills, because the city has not released estimates of how the whole project will affect water rates. Wes Jones, a spokesman for SDG&E, said the company is trying to reduce the city’s costs.